Posted January 31st, 2019 at 11:56 AM (CST) by Bill Holter & filed under In The News. I would point your attention to the MACD weekly crossed over to the downside in mid December. These crossovers can go 4-6 months or more. 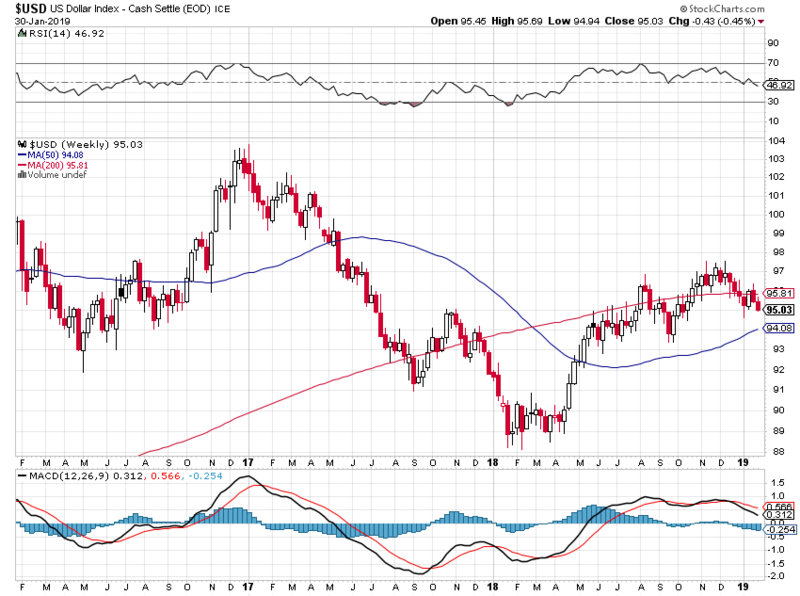 Now the question is how far the dollar weakens…versus gold? A HUGE move coming! Beijing Kang Dexin Composite Material, a hi-tech material firm that supplies optical film products to Apple and carbon fibre materials to Mercedes-Benz, tumbled by its maximum-allowed 10 per cent on Tuesday to a record low of 6.46 yuan on the Shenzhen Stock Exchange. Its market cap has plummeted 58 per cent in the past two months to 23 billion yuan from 54 billion yuan. Tuesday’s plunge came after the firm announced it’s likely to default on the payments of two corporate bonds worth a combined 1.56 billion yuan. One is due on Tuesday, with an amount of 1.04 billion yuan, while the other will expire next Monday.